OD to change and develop their departments. knowledge that all effective OD practitioners must possess. however, suggests that OD practitioners must cope with the possibility of professional burnout. guiding OD practice and in minimizing the chances that clients will be neglected or abused. Who is the Organization Development Practitioner? geared to helping organizations cope with those pressures. projects have become more comprehensive, involving multiple features and varying parts of organizations. process, typically by engaging OD professionals and managers to design and implement change programs. become its most basic practitioners. 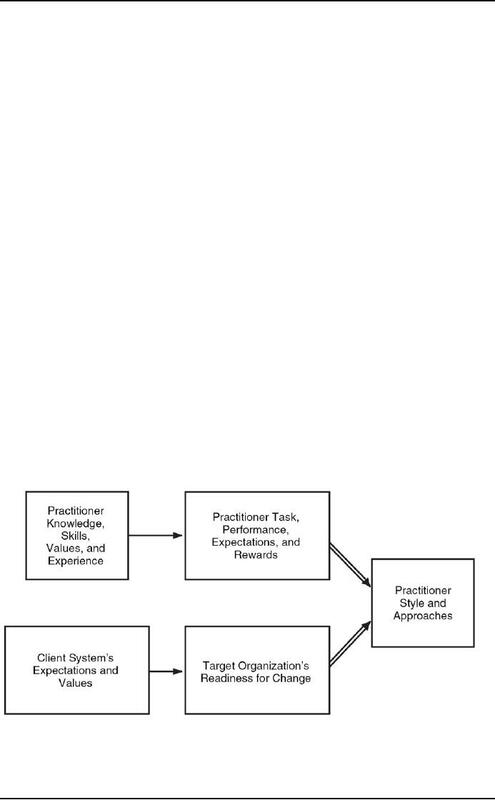 experience than a traditional practitioner. the use of external and internal practitioners have advantages and disadvantages. outside, the external practitioner sees things from a different viewpoint and from a position of objectivity. influence and status within the client system) and greater freedom of operation than internal practitioners. large-scale change programs than internal practitioners. though, that McKinsey's management consulting work is not necessarily organization development. management consulting firms face in Germany. organization, and before they understand and have developed critical skills. authority; internal practitioners are sometimes in a remote staff position and report to a mid-level manager. innovation, creativity, teamwork, and trust within the organization. in large organizations, the team will likely consist of more than two practitioners. environment (i.e., at a resort) and the participants dress in civilian clothing to lessen authority it issues. leverage might have provided enough support and influence to gain approval to the desired program. client system has its own subculture and level of readiness for change. "buy in" on the change program--in effect, to get involved in soling the problems. Questions --"How do you see the organization?" Applied expertise (advising) --"One possible intervention is team building." Reflection ­ "It sounds like you would like to see a participative form of leadership." Interpretation --"From your description, inter-team conflict could be the problem." Self-disclosure --"I've felt discouraged myself when my ideas were rejected." Silence --Say nothing, let the client sort out his or her thoughts. · What is the attitude of the client system toward OD? Is there a real underlying desire for change? Or is the attitude superficial? problem or are other change programs more appropriate? probable is it that the practitioner can bring about significant change? the client on these issues at an early stage.